I was deploying Intune at a customers site this week when clients started getting sync errors within the Device sync status screen. The only change that had been made, was that ZScaler web filtering had been installed. Within ZScaler there is a Office 365 option which makes traffic destined for Office 365 bypass filtering. Checking the web filtering logs I could see the device contacting r.manage.microsoft.com a URL on the Microsoft Intune URL Page. 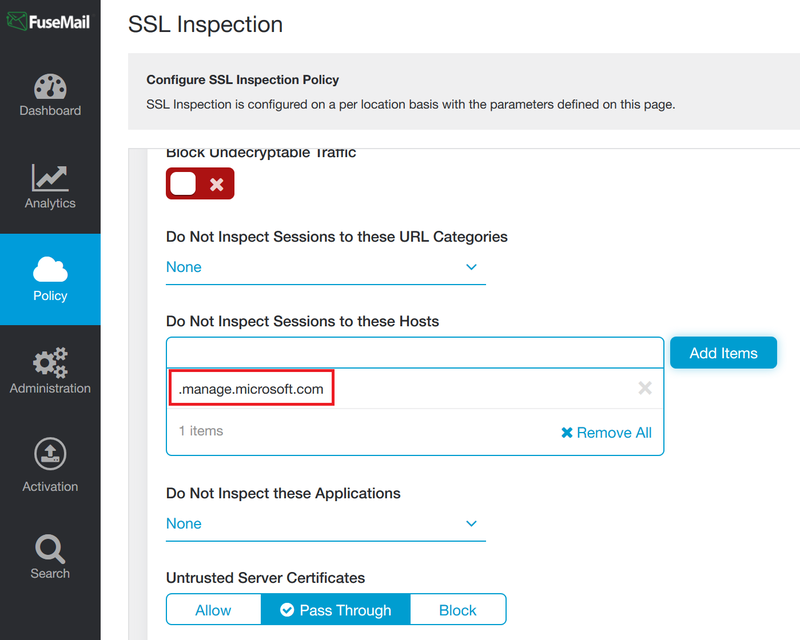 I then added .manage.microsoft.com to the SSL inspection bypass list and normal service resumed. The preceding dot ensures that subdomains are included. Surprised that this URL is not included within the Intune Application in the Office 365 section.